Important collection of 15 letters from various Zionist organizations around the world to the Land of Israel (most to the aliyah department of the Jewish Agency) mainly from the 1920s and 30s. The letters were sent from different countries: Cuba, Egypt, Turkey, Argentina, Greece, Denmark, Yugoslavia, Belgium and additional places. For the most part, they deal with requests for permits to immigrate to the Land of Israel. Various languages: Hebrew, German, French and Greek. Almost all of the letters deal with requests for support and assistance for diaspora Jewry, a good number are requests for permits ["certificates"] to immigrate to the Land of Israel. An interesting detail is that in most of them, the Zionist organizations ascribe their requests to the fact that the people for whom they are requesting the certificates have been and are presently engaged in Zionist activities, and therefore deserve to be given permits to immigrate to the Land of Israel. 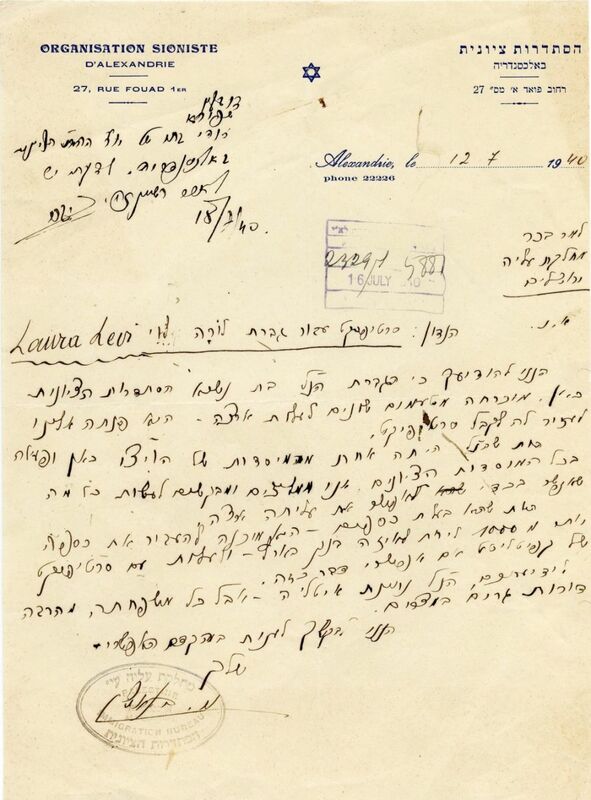 For example, there is a letter which was sent by the Zionist Organization in Alexandria in 1940 with a request for a certificate for Mrs. Laura Levi, daughter of the president of the Zionist Organization in Egypt: "The above woman, the daughter of the president of the Zionist Union here, must, for various reasons, immigrate to Israel ... she was one of the founders of WIZO here; she was was active in all the Zionist institutions, we recommend and request that you do everything possible to enable her immigration to the Land of Israel ..." A letter from 1927 on behalf of the Zionist Federation in Ossetia (Russia) appears to assist obtaining a permit for the Fried family to enter the Land of Israel, who, according the opinion of the father of the family, 'should immigrate to the Land of Israel so that they can educate their daughters in an Israeli environment ...' He was here for a few years, and some of his donations were to the UIA." There is a letter sent on behalf of the Zionist Federation in Brazil in 1935 with a request for an immigration permit for Prof. M. Benenson, as follows: "He is one of the few Zionists who relates to Zionism with a clean, pure heart and who is both wholly and enthusiastically dedicated to the work. Zionism is the essence of his life and his thoughts; he has worked for it for 35 years and he has dedicated his extensive knowledge and experience for tens of years ... his honor should make an effort ... to fulfill the professor's request ... and make it possible for the gates of the Land to open for him ..."
Most of the letters are printed on the various Zionist organizations' official stationery, stamped with ink stamps and signed by hand. Four letters are handwritten (they are also on official stationery). Some of the letters have Jewish Agency administration stamps documenting the receipt of the letters. Three of the letters have JNF stamps stuck on them. Various sizes, overall fine-very fine condition.